World 7-5 is the fifth level of World 7 in Super Mario 3D Land. The level is a wood platform-based area, with several Grinders to slice the wood apart and potentially harm the player. The beginning point is on a wooden platform; on one end is a platform leading to the next wooden platform, and next to it is a platform with a Grinder ready to slice it off. 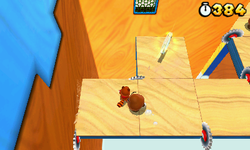 After crossing several individual wooden platforms, the player reaches a cluster of them, with several Grinders and Goombas. The player must then cross through a pass composed of three wooden platforms about to be sliced off to get to one large wooden platform. Next to this is a wooden platform that rotates around to reach another platform, with several Grinders set at various points to chop off a segment of the platform. The next platform is followed by a cluster of wooden platforms with several Grinders to cut off each area of the platform. On the platform connected to this is the Checkpoint Flag, and after crossing several wooden platforms to be cut off by Grinders, the player reaches a grassy platform. Afterwards is a wooden platform traveling along a straight path, with several Grinders to cut off segments of the platform and poles to stop each segment and send it to the ground; there are also Paragoombas and some spikes. Afterwards is a grassy platform with a wooden platform staircase and the Flagpole. Star Medal 1: The first medal is found near the beginning of the level, where a Grinder is starting to cut the piece of wood the medal is on. Star Medal 2: Just like the first medal, the next medal is found near a few Tail Goombas, on a piece of wood that is being cut by a Grinder. Star Medal 3: At the end of the level, the player will be riding a big slab of wood, which will be cut into 7 pieces. The player should stay on the leftmost piece to grab the medal.